When I think of camping, I remember about the good old days I had as a child. I can imagine the cool nights I spent with my childhood friends in our backyard. What made it even more special were the food, stories and laughter I shared with them. Who would imagine that making these memories can be done not only outside our home during cool nights but also during our special days? Nothing is impossible with Bespoke Manila. 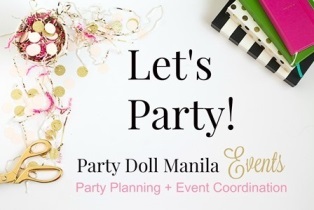 They did an awesome job in bringing their “classy yet never dull” signature look to this oh-so-cozy dream birthday party. How will you say no to an invite as warm as this? Designed by Ria Pascual, this tame little cub couldn’t be more welcoming! The sight of this entryway makes me want to just slouch and relax! The party area looks so comforting from here. The homey ambiance of their stage setup makes me feel like I can snug on it. Its earthy but contemporary style is just right for this charming bash. Very Bespoke Manila indeed! The tables decorated with flowers, warm striped linen and wooden chair provides an intimate, family centered atmosphere. It definitely feels like home! I get really excited when I see bento boxes. I can’t help but have a joyful anticipation upon seeing what’s in it. They are just perfect for the kiddies! Beauty is in this simple yet very pretty multi layered cake by Mesculin. This old-fashioned treat still brings out the sweetness in those that were born to be wild! Brandon’s dessert spread is an eyeful of deliciousness. These eye candies are just too good to resist! We can start devouring on these soft little confections and finish off with these crunchy members of the gang. Or you can go freestyle by building your own like what Brandon suggests. Speaking of coziness and comfort, look at these yummies from Brandon’s food carts. Gelato, chocolate drinks and tacos are exactly what we look for when we curl up in bed all day in rainy days. Thank you for these lovely personalized ecobags, Brandon! It sure is a camping must! Who else make the best camping buddies? Mom and dad of course. Hello there happy campers!